I’ve been doing some work behind the scenes on the website (again), which has kept me away from the blog. It’s a lame excuse, I know, so to make up for it here is the result of some experiments over the last few days involving cheesecake. There’s nothing like a good old-fashioned baked cheesecake, a delicacy (if you can call it that) often associated with Eastern European Jewish cuisine, though there have been suggestions that it may have been an English invention. 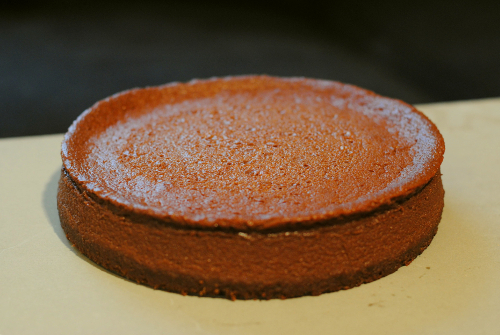 I wanted to try out the chocolate cheesecake from the Hummingbird Bakery Cookbook, but the recipe required a 23cm springform tin (which I didn’t have) and nearly a kilogram of cream cheese. Calculating that this would make enough to feed everyone in the street, I attempted to scale it down to fit my 18cm sponge tin. Some trial and error was going to be involved in adjusting a recipe like this, but I think I nailed it. Preheat your oven to 150°c. Crush the digestive biscuits in whatever innovative way and to whatever consistency you prefer, and add the cocoa powder. Melt the butter over a low heat, pour over the crushed biscuits and mix well. Press the mixture into an 18cm cake tin (I use a loose-bottomed Mermaid tin). That’s that bit sorted. For the filling, you can use Philadelphia, quark or ricotta, but I opted for mascarpone. The end result is softer and creamier than you would get with the firmer cheeses. Combine the cheese and sugar and beat until smooth. Break the eggs up with a fork or whisk, then add them, a little at a time, to the cream cheese, mixing well after each addition. It’s important to have beaten the cream cheese first, otherwise you’ll have a Devil of a job to incorporate the eggs and get a smooth mixture. Once you’ve mixed the eggs in, add the vanilla essence. You don’t have to use this, but if you might as well if you have it. In a heatproof bowl suspended over a pan of boiling water, melt the chocolate. 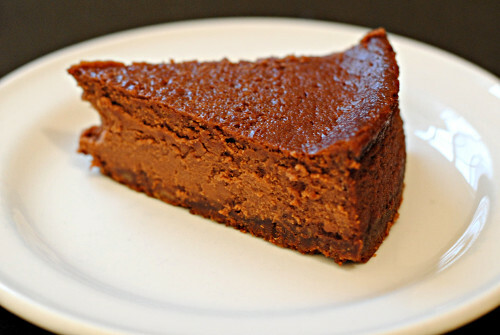 I recommend using dark chocolate: you need the slight bitterness to offset the richness of the cheese filling. You don’t need all that much, so push the boat out and get something decent. I used Green & Blacks Dark 70% and didn’t regret it one bit. Once the chocolate has melted, pour it over the cream cheese mixture, stirring it constantly. You don’t want the molten chocolate to set any of the egg in the mixture, and you need to incorporate the chocolate before it begins to cool and solidify. Using a mixer makes this less of a juggling act, but it’s not so difficult. Pour the filling into the cake tin. The cheesecake is going to be baked in a water bath, so place the tin on a double layer of strong foil and fold it up around the edges; this should prevent water getting in. Put the foil-wrapped tin in a roasting pan and pour in enough boiling water to reach about two-thirds of the way up the sides. Place it carefully in the oven and set the timer for 30 minutes. 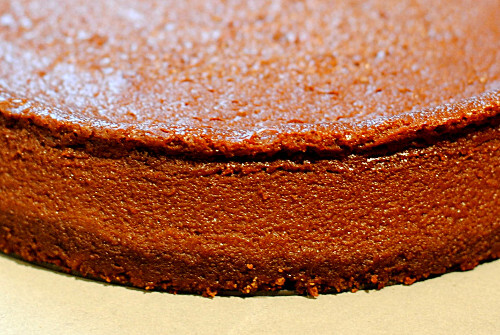 Check the cheesecake when the timer goes. It will probably need longer, but ovens vary and you don’t want to over-bake it. You should see that the filling around the edges of the tin has set, but the middle will still be liquid. Keep checking every five minutes or so. When the middle of the cake has just set, but still wobbles slightly, remove it from the oven and the water bath and leave it to cool on a rack. Once it has cooled to room temperature, refrigerate it for a couple of hours, or overnight. Even this scaled down version of the Hummingbird recipe produces enough for six substantial slices. Serve it on its own, or with some pouring cream artfully drizzled over, just like what they do in them posh restaurants. « When more is less	» A new edition!